On 18 august 2016 Nico Huijbregts played improvisations on the piano based on “graphic scores” of other residents: Carlos Michel Alves gave a video of an insect floating in the water, António Pliz shows architectural sketches, Catalina Ouyang made an animation with her marble sculptings, Yvonne Halfens showed a a stop motion of moulding clay, Scott Sherk supplied a soundscape of the sea in Maine, Pat Badt brought some painted grass blades, Saaya Hitomi let Nico take a tarot card and Ludger showed a wooden necklace. The improvisations in combination with the graphic scores were more than fascinating. 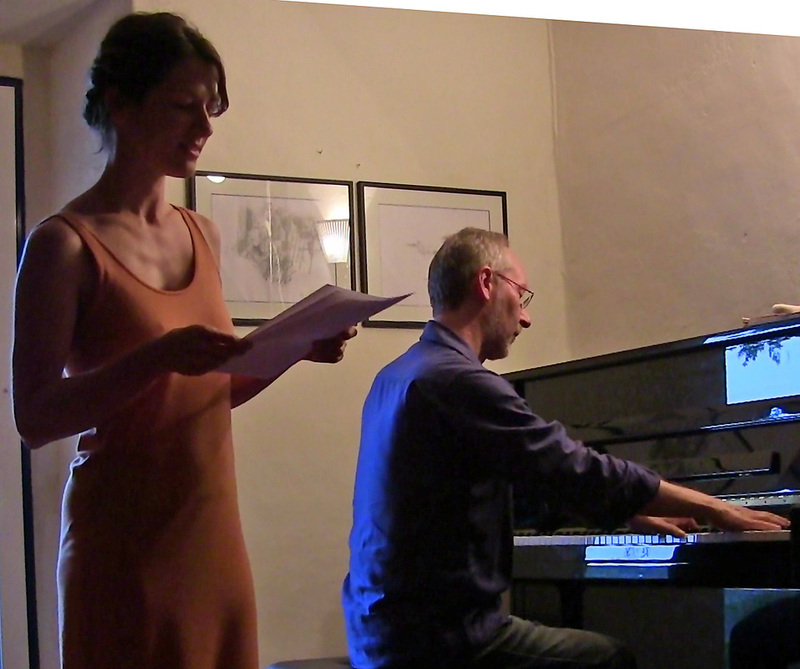 Later that month Nico did improvisations with Hannah Pass and Gerry van der Linden reading her recent work (prose and poems, respectively) and with Elena Chaeh and and Raphaelle Oskar (cello and voice). In May 2012 Nico Huijbregts worked at the Residency Centre of Foundation OBRAS in Evoramonte, Portugal. With his back close to the walls of the buildings he sketched the landscape, wrote down what he saw and then moved some 7 meters to repeat this action. He did this 54 times spread over 29 days, thereby completing a loop around the buildings. In addition he made photos of the wall on all 54 positions. In 2013 he continued working on this project, first in the UK and later in Holland. He was using the wall photos as a starting point to make 54 little, largely abstract paintings. These were exhibited in October 2013 in Potsdam, Germany and are now shown at the place of their origin: the Centre of Foundation OBRAS in Evoramonte, Portugal. The slideshow below shows the body of work as a whole as well as in some detail. The works range in size from 6x8cm to 15x20cm. “Homeland” was project of a collective of six artists, named “the Family”. 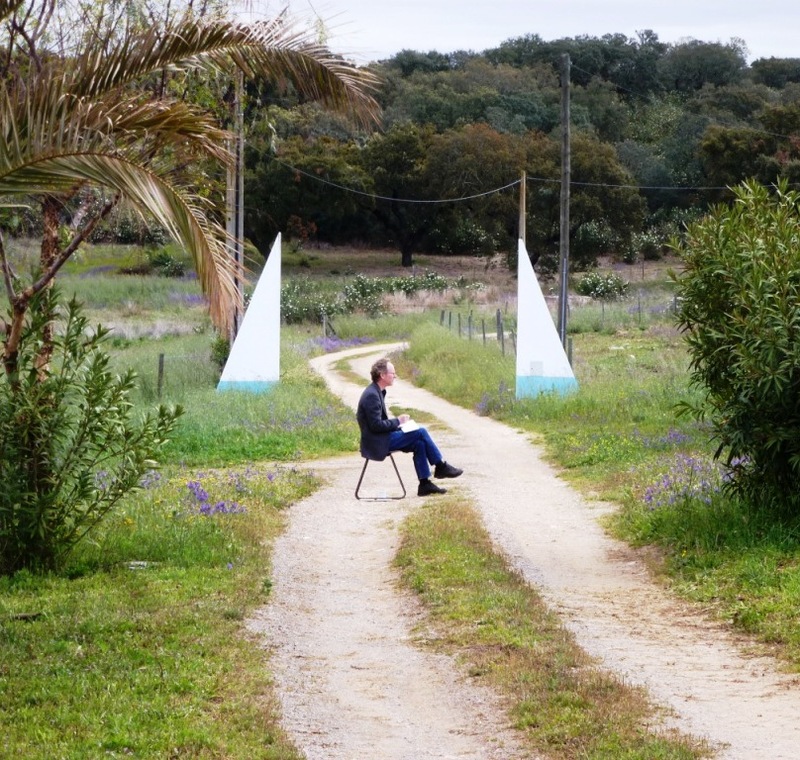 They had a residency at Foundation OBRAS in Evoramonte, Portugal in May 2012. 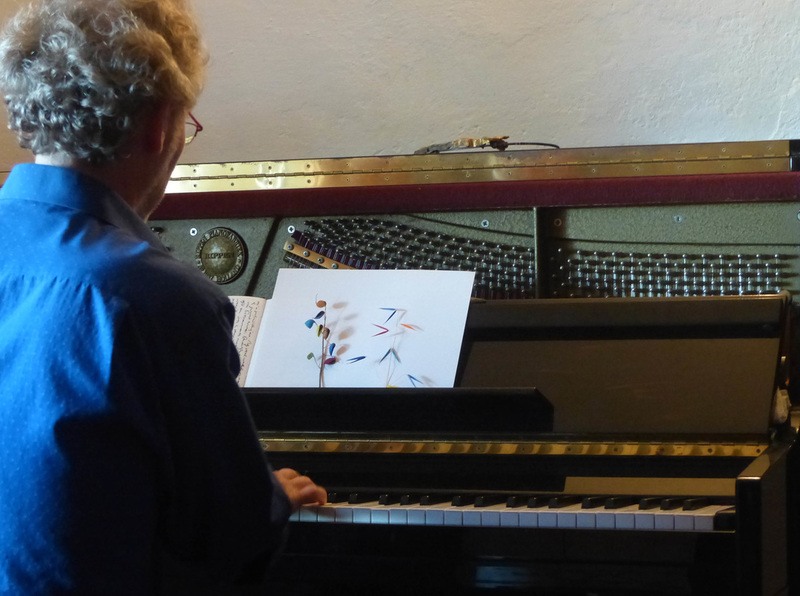 Their residency was concluded with a an exhibition and a concert in which Nico Huijbregts improvised on piano with the visual art works of the other artists as source of inspiration. Both the exhibition and concert took place in Casa da Zorra, in Évora, Portugal. This video gives an impression. When you move, you discover that you're a spectator of landscape that will never fully take you in. In order to feel at home with a place, a person, a community, something, you must descend into yourself and find something of which you can make an anchor and hope it stays hooked on something. On each location Nico Huijbregts made some drawings and wrote what he saw and felt. Fence. A long drawn faded beige stone behind it sticks out just above the grass. Faded beige bird on the corner of the stone. Humming bees crawling in and out of the cups of the pale purple Viper’s Bugloss. I am now at the far end of the meadow. Behind the stone an oak tree, dripping with heat. Behind it the full strange autumnal foliage of other oaks. Northwest in the valley before me a stain of yellow flowers between the Viper’s Bugloss. This bit of color makes all that dusty green bearable today. On the right of me an old oak, bending over, awaits me. A woman sits on the bench that girds its trunk. She is reading. The wind rises slightly more. A bee zigzags nagging a few times in front of my face. Then the cloth of the parasol suddenly flaps fiercely, with a sound like a bird that waves its wings attempting to rise in vain. Nico Huijbregts composes music for orchestra, ensemble, solo - quartet, and voice. His compositions were performed in many European countries and were also used with theater, dance and movie. In April 2014 a CD entitled Hoe Alles Oplost, with five new works was released (Vindu 20141, distribution: www.toondist.nl). The artist also performs on the piano. A CD with his improvisations was released in 2011 (icdisk.nl nr 0702). Other CDs are KaDaVer (2011), Falsche Tango (2010), Free Floating Forms (2009) and Let me Tell you (2007). Nico Huijbregts is also visual artist and writer.